Where did PebbleCreek and its resort-style land on this year's list? We've got the answer below. Based on page views from January 1, 2018 to December 31, 2018, there were several communities that stood out in Arizona. With a resort-like environment and world-class amenities, these popular age-restricted communities offer the best in active adult living. Learn more as we explore Arizona’s most popular communities from 2018. Sun City was the first age-restricted community in the country, and today it still remains one of the most popular. Known for its sprawling, self-contained layout, this 55+ community is home to well over 27,000 residences. Buyers can choose from a selection of condos, single-family homes, and attached homes. Sun City’s affordability is one of the reasons it continues to attract new buyers every year. In terms of amenities, it’s hard to beat Sun City’s offerings. There are many recreation centers scattered throughout the community. Residents enjoy access to a performing arts theater, ballrooms, nearly 20 shopping areas, an amphitheater, and more. When residents want to explore their crafty side or pursue a new hobby, they can spend some time in several well-equipped studios for woodworking, crafts, and ceramics. Sun City also makes it easy to embrace an active lifestyle, both indoors and outdoors. There are fitness centers, swimming pools and spas, walking tracks, courts for tennis and other sports, a softball field, and more. The community also boasts 11 golf courses designed for all levels of play. For those seeking the Sun City lifestyle on a smaller scale, Sun City Grand is sure to be a great fit. This 9,802-home community offers condos, attached homes, and single-family homes for buyers aged 45 and up. With several recreation centers to choose from, residents can live a vibrant lifestyle. Amenities include state-of-the-art fitness centers, a studio for aerobics and dance, multiple resort-style pools, a coffee shop, and more. The on-site ASU Lifelong Learning Academy allows residents to attend engaging lectures and classes. The amenities continue outdoors with four championship golf courses, a softball field, and courts for tennis, bocce ball, and pickleball. The community is also home to fishing lakes and a pet park. Sun City Festival offers modern homes in a resort-like setting. Those seeking a younger atmosphere will appreciate the lower age restriction of 45 and up. Upon final build out, this community will be home to 7,200 single-family residences. The current selection of new and resale homes range in size from 1,099 to 2,849 square feet. Modern active adults will enjoy Sun City Festival’s high-end amenities. The 31,000 square-foot Sage Recreation Center is the social hub of the community. 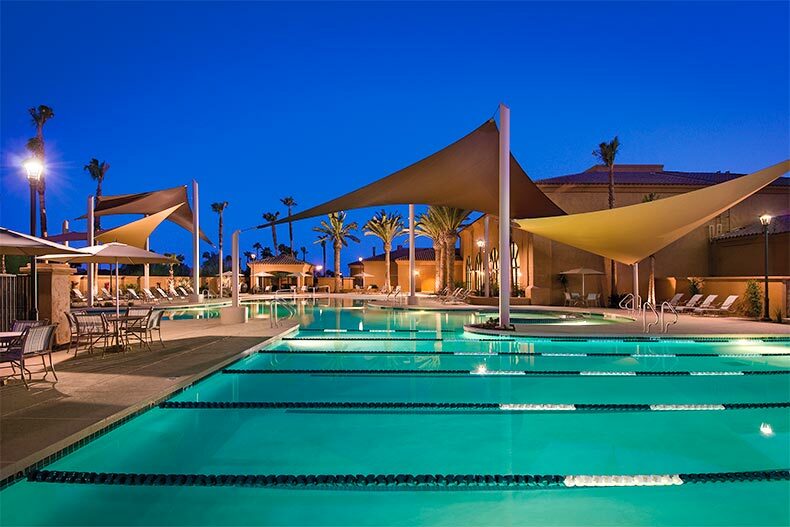 Here, residents can exercise in the state-of-the-art fitness center and aerobics studio, pursue their interests at the ASU Lifelong Learning Academy, or celebrate special events in the ballroom. The separate Wood Shop and Craft Studio offers 9,000 square feet of studio space for woodworking, ceramics, and crafts. Outdoors, residents enjoy access to a pool and spa, walking trails, a softball stadium, and courts for tennis, pickleball, basketball, and other sports. The community is also home to a golf club with an 18-hole course, a pro shop, and practice facilities. PebbleCreek is one of the top choices for high-end retirement living in Arizona. The community’s elegant, Italian-inspired architecture adds to its luxurious appeal. Upon completion, PebbleCreek will consist of 6,200 single-family homes and attached homes. Residents can live the country club lifestyle with PebbleCreek’s amenities. The well-appointed Tuscany Falls Country Club offers a 332-seat theater, coffee bar, restaurant, and a 27-hole golf course. Additional recreation centers in the community offer top-notch fitness centers, resort-style pools and spas, and creative arts centers where residents can work on their hobbies. Residents also have access to numerous sports facilities and an additional 18-hole golf course. With reasonably priced homes and modern amenities, it’s no surprise that Sun City West is one of Arizona’s most popular communities. This 16,900-home community has a great selection of single-family homes and attached homes available for buyers aged 55 and up. Residents can enjoy the same amenity-rich lifestyle offered by all Sun City communities. With on-site grocery stores, banks, pharmacies, and restaurants, the community offers the best in low-maintenance living. There is also no shortage of ways to stay social and active at Sun City West. The community is home to nine golf courses, multiple swimming pools and spas, arts and crafts rooms, and fitness centers. There are also numerous sports facilities for friendly competition with neighbors.